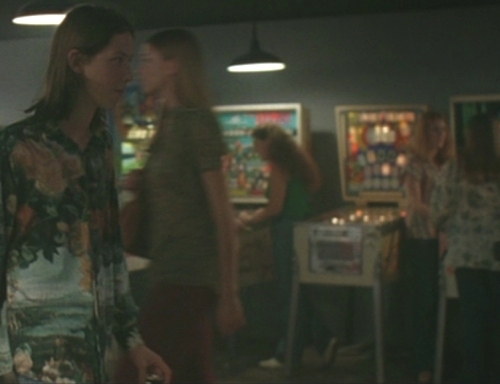 Dazed and Confused, the 1993 film by Richard Linklater that chronicles the last day and night of high school in 1976 for a group of suburban Texas teenagers, probably features the most pinball in any movie I've ever seen. 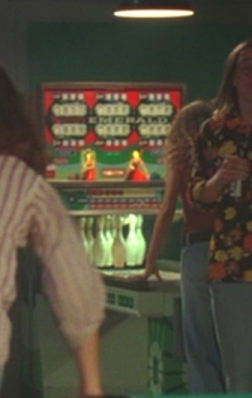 Considering that I graduated high school in 1975, the arcade/pool hall featured in the movie is right out of my teenage years. What really peaked my interest in the arcade scenes was the shuffle alley just by front door of the "Emporium". A shuffle alley is not something I think I've ever seen in a movie or on TV. 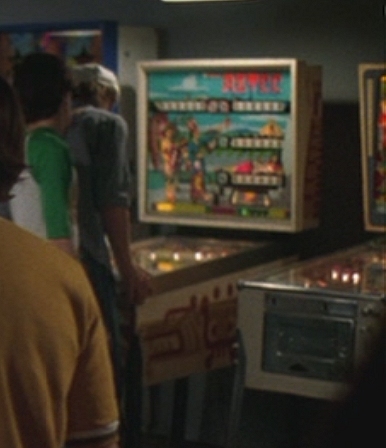 The most familar pinball scene in the movie is the close-up playfield action on a Bally Fireball. But what about the other games in the movie? I did do a google search and a search on the Yahoo group dedicated to the movie ("the Moontower") to see if anybody else has tried to identify all the games in the movie. Other than the reference to the Fireball, I couldn't locate any other sites or posts that listed the games at the Emporium. So I loaded up the Criterion DVD on my laptop and with the help of the pause button and the Internet Pinball Database and it's advanced search capability, I've been able to identify the 9 games in the line-up and also the shuffle alley by the door. Here is the famous "entrance" scene where Wooderson, Pink and Mitch first arrive at the Emporium. Played in slow motion with Dylan's haunting "Hurricane" as the soundtrack, it's one of the coolest scenes in the movie. And at the right of the frame is a Williams Emerald Shuffle Alley, released in 1975. Would you have seen one in your local arcade in May of 1976? Probably not. Would the Emporium have had one. Maybe, due to the number of pool tables located there. Shuffle Alleys were usually always placed into bars frequented by an older crowd and used for organized "league" play. They were located in an area where the bartender could keep an eye on the machine, as the puck and the alley wax had a habit of growing legs and walking away. The exposed "pins" could be a target for vandalism in an unsupervised area. Never played a shuffle alley? It's basically bowling with a small metal puck, about 4 inches in diamater and about 8 ounces. You slide the puck down the alley and a where the pins would be located are a series of switches. Depending on how the puck travels over the switches, the game determines what pins would be "knocked down" if you were bowling and then raises the pins. The game scores like regular bowling, although almost all games have some special play and scoring options. Later in the movie, when the guys return to the Emporium after their adventures with the mailboxes and the convenience store, there is a pan shot of the interior of the Emporium and there is an extra standing at the alley looking like they're playing. From what I can tell of the score reels, they haven't let a shot go yet! 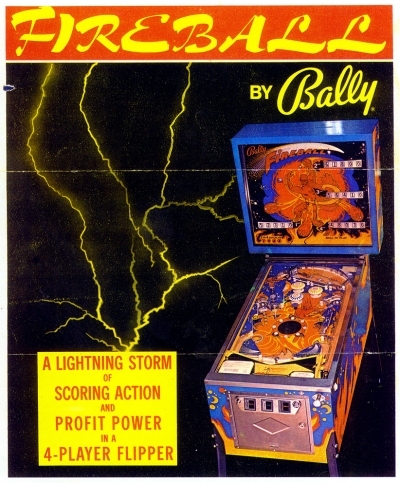 The pinball machine most associated with Dazed is Bally's iconic 1972 classic "Fireball". This is the game that is featured in the close-ups and on the menu of the Criterion DVD. 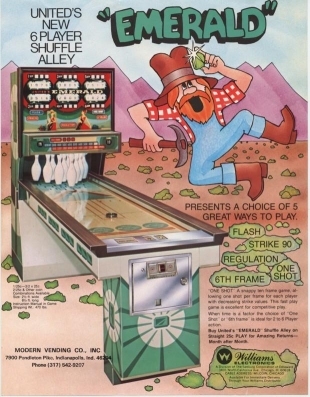 Bally was the #1 pinball manufacturer throughout most of the '70s, not losing that title until Williams surpassed them for good in 1979 (10 years later Williams bought the Bally pinball line). And Fireball was one of the top 5 games it produced in the decade. Would you have seen a Fireball at your local arcade in 1976? Most definitely yes! And you would probably have had to put your quarters on the glass to get a chance to play it. An extremely popular machine, it was one of the few electro-mechanical pinball machines to feature multi-ball (two or balls in play at one time). It also features "zipper flippers", where hitting a certain target or targets will cause the flippers to close-up so that a ball can't drain between them. 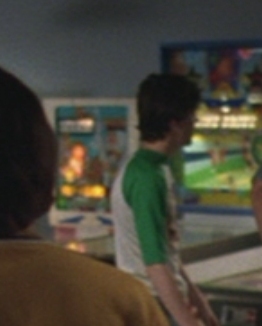 Listening to the director's commentary on the Criterion DVD, Rick Linklater states while Fireball is his favorite of all the games in the movie, he thought that it was the least likely to fit into an arcade scene from 1976. He's actually dead wrong on this one, Fireball was probably the most likely of all the games on the set that would have been in a 1976 arcade. While it was going on 4 years old at the time (a long time for a pinball machine to be on location in previous decades), Fireball was such a prolific earner that it lasted well in the late 70s and early 80s at most locations. 1. The Fireball is the first in the line of games, all the way to Slater's right. We can actually see the game in this shot, it's the light blue back box just over Michelle's right upper arm. 2. We never actually "see" the game that Slater is playing. A bit of editing makes us think it's the Fireball, however I think it's actually the Bally "Odds and Evens". In the panning shots of the games, there is more room between the "Odds and Evens" than the other games, which is left so they could pull the game out easily for the Slater shot. 3. What is Michelle sitting on? 4. The machine was pulled out about 8 feet to make room for the camera. 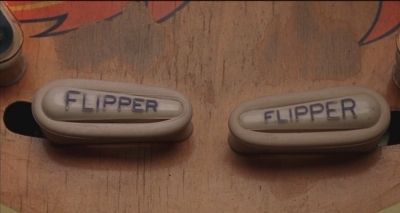 The "zipper" flippers from the Fireball. The flippers are in their closed position, which makes it impossible to for the ball to drain if played correctly. However most people always bang away at the flippers, causing the ball to just slide around the flipper that is in the up position. There is nothing more maddening than to be playing a zipper flipper game with the flippers close and have the ball drain on you! 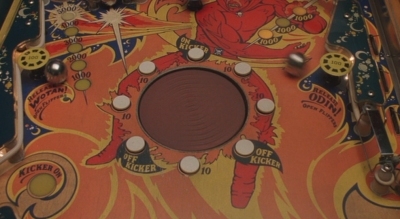 Fireball was one of the few electro-mechanical games to feature multi-ball play (two or more balls in play at once). For you post baby boomers out there, electro-mechanical pinball games contained no electronics, they used relays, solenoids and a motor to control the entire game. Rick Linklater was so enamored with the game that he bought it at the end of shooting and still has it today. There are nine games in the pinball line. We're moving from right to left down the line. We've already discussed the pinball "star" of the game, so let's continue with the supporting case. 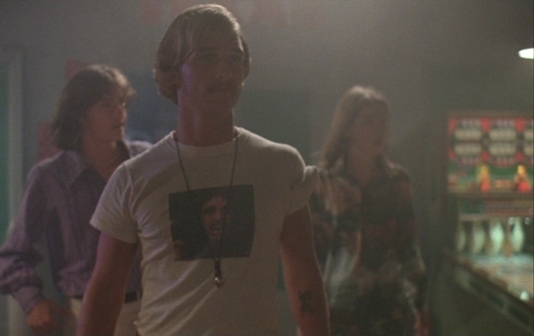 The first member of the Dazed and Confused pinball supporting cast is a Williams Pat Hand. Released in May of 1975, it would have been a perfect fit at the Emporium on May 26, 1976. Here we get a nice shot of it over Mitch's shoulder when he's telling Julie about the plot to set up O'Bannion across the street at the machine shop. 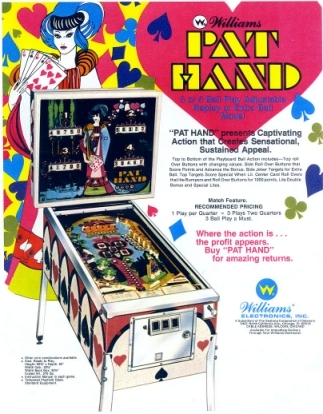 Pat Hand, like many other machines released during the 60s and 70s, was based on a playing card theme. The thought at the time was that everybody understood playing cards, so understanding the rules of a pinball based on cards should be easy. This was long before the day of movie and TV licensing agreements. 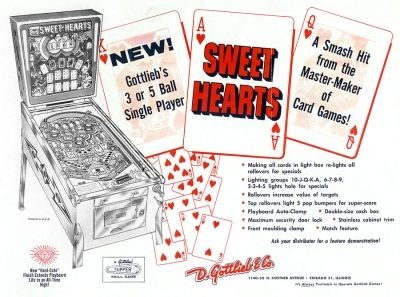 Moving down to game number three we run into a Gottlieb Sweet Hearts. Released in 1963, this game belonged in a pinball museum by 1976! Would you have found this game in your local arcase in 1976? Not a chance! The game featured a hard wired nickel coin slot and a manual ball feed. Players hated the ball feed and operators hated the nickel per game income. I last remember seeing games of this vintage on location in the late 60s at our local bowling alley. By 1976, most games from this vintage had been sent to the back of an operators warehouse or to obscure locations like summer camp grounds where there were no other enterainment options. Today these games are in demand and are valued over $1,000. Fourth in line is a Williams Aztec. Would you have found this game in your local arcade on May 26, 1976? Not likely, since it wasn't released until July of 1976. Rick Linklater stated that nothing could appear in the movie that wouldn't have been authentic on May 26, 1976. He did pretty well, but missed by a few months on this one. I think the movie's general thought was that if a game was an electro-mechanical game, then it would be authentic. 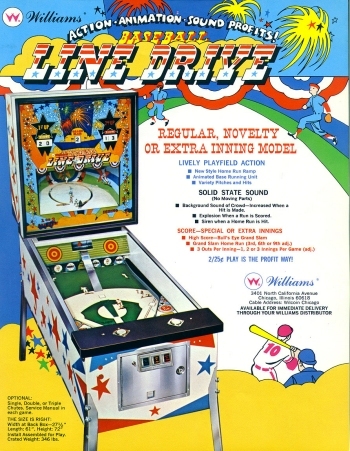 Solid State pinball games did start appearing in early 1976, but Williams and Gottlieb continued to produce electro-mechanical games into early 1978. 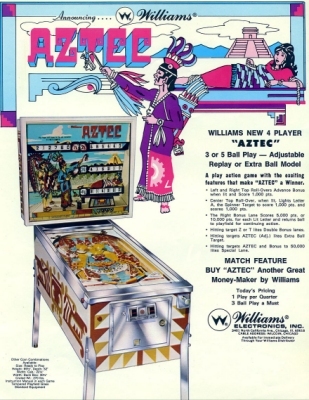 Aztec was actually Williams first solid state game, with a few prototypes released in the fall of 1976. 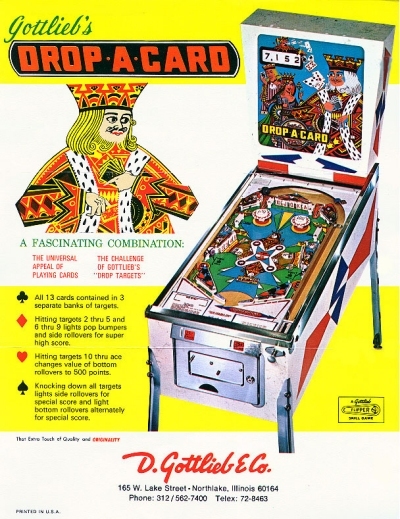 Williams first widely released solid state pinball was "Hot Tip", released in early 1977. Electro-mechanical games held on for a bit longer, as Hot Tip and Williams next relase, "Lucky 7", were also released in electro-mechancial versions. The electro-mechanical era came to an end for Williams in January of 1978 with the release of "World Cup" in only a solid state version. The next game in line looks like a pinball game on steroids. A game designed for pro-basetball players and other seven footers? Nope. Actually, it's not even a pinball machine. It's what's known as a "pitch and bat", a two player baseball game. This is a Williams 1972 Line Drive. It features an animated back box where little tin players actually run the bases. Let's put this one to the arcade test. Would we find a Line Drive in our local arcade in 1976? Most likely. They were extremely popular until the advent of video games in the late 70s. Non-pinball arcade games, such as pitch and bats, gun games, periscope games and driving games fell completely out of favor by the late 70s, replaced by video games such as "Breakout", "Space Invaders", "Defender" and a 1,000 other titles since. The last four games in the line were a bit tougher (with one exception) to identify. They got very little "screen time" and what time they did get was as a blurry background. The sixth game in the Emporium lineup is a Gottlieb Drop-A-Card from November of 1971. The picture at the left is the best I could find of the game and there wasn't much to go on. Now that I've identified the game it's easy to make out the King on the right of the backglass, but it's like those "can you find the six differences" puzzles. After you've cheated and read the upside down print, you can tell at a glance what's different, but when you first look at it, not much stands out. Knowing that this is a Gottlieb "wedgehead" game (named after the shape of the backbox), I went through photos of all of the wedgehead games looking for the blue triangles at the bottom of the backbox. Time for the arcade test. Would we find a Drop-A-Card in our local arcade in 1976? This one rates a "maybe". New enough that it could be set to either 1 or two games per quarter, so it could still make money. However a 5 year old single player game may have played itself out.